Roger Manley bought his Tesla Model S about six months ago and has put quite a few miles on it since then. He and his wife and son are adding a lot more miles while touring America’s National Parks in Arizona and Utah. I’ll let Roger tell the tale. Hi John, I’m sitting in my Tesla charging at the Buckeye supercharger. I am meeting Carolann at airport at 3 PM this afternoon. We’re staying in Scottsdale for the week. My son Brian is flying into Flagstaff next Saturday and we are driving a loop around southern Utah to see the national parks. I left yesterday and stayed Needles last night. I’ve driven seven hundred and 20 miles to the Buckeye charging station. I didn’t have to wait anywhere except for Barstow because there is a lot of traffic going to Las Vegas for some major convention. Thought I’d let you know that I’m taking the Tesla on the trip! The Tesla is working perfectly and getting the mileage that I expected based on evtripplanner.com. The goal of this trip was to try out the Tesla on a long drive, using supercharger capability where possible and a few RV parks along the way. The first leg of the trip was driving from Monterey to Phoenix. The second leg from Phoenix through Southern Utah with stops in Monument Valley, and then four National Parks including Arches, Canyon Lands, Bryce Canyon, and Zion. I also planned the entire trip on Evtripplanner.com. This allowed me to select the route with energy usage estimates for the various charging legs. Overall, I found this tool to be fairly accurate and would recommend it highly. In addition the 6.2 release from Tesla was received the week before I left and it promised “the end of range anxiety” with its new trip planner software. However, it is a beta version currently. It worked fine until I got to the first stop and then I couldn’t get it to recognize my second planned stop at Mojave. There weren’t a lot of directions on usage so maybe it was pilot error on my part. After I finally got it to cancel, I went back to using the Energy Usage App showing the Trip Leg planned in Navigation which estimates battery usage at the finish point. I find that works really well and matches closely to Evtripplanner estimates. I’m sure the new software will get better with the next OTA release. The first day my goal was to drive from Monterey to Needles. Initially I had planned to drive through Los Angeles and Palm Springs, but found the Coachella Music Festival was going on at that time and there wasn’t a place to sleep within a 100 miles of the Indio Supercharger. So with the Mojave Supercharger just opening I decided to go north and stay out of the traffic. My first stop was Harris Ranch in Coalinga after a beautiful drive over highway 198 from just south of King City. It was 127 miles. I used 40.4 kWh at 318 W/m with 44% battery left. I was a bit surprised that I used 144 rated miles. But, I figured out it was 46 degrees that morning which probably increased energy usage slightly. Harris Ranch is a huge beef “CAFO” with restaurant and Inn. There were 8 superchargers and space when I arrived, but within a few minutes all were full. Most of the time I was charging at 87 to 120 amps. I believe this is one of the original superchargers and isn’t as fast as the new ones which are much more powerful. Next stop was the Mojave Supercharger. Actual mileage was 164 and rate miles used was 185. I used 51.5 kWh at 315 W/m. Arrived at Mojave with 57 rated miles left. The rated miles are higher on this leg because of the approximate 3000 foot climb up the mountains out of Bakersfield. The Mojave Supercharger is brand new and charges very fast. It is located in a small shopping center next to a cafe that serves Mexican food, a grocery store, and a few other various shops. Third stop of the day was in Barstow, only 73 miles from Mojave, but I wanted to top off for the longer drive to Needles. Barstow was very busy on this Friday afternoon. All eight superchargers were full and I had to wait about 10 minutes for an open stall. Barstow is a huge freeway crossroads with lots of traffic from L.A. to Las Vegas. Apparently there were some big conventions in Vegas that weekend. There were several new P85D’s there and that was the first time I had seen one. The Barstow Supercharger has a solar platform over 4 of the charging stalls that also provides shade. I used 76 rated miles, 20.7 kWh at 284 W/m. I left Barstow and set out to Needles, my last stop of the day. I arrived around 6:15 pm after starting the day at 7am. The last leg was 149 miles and I used 152 rated miles. 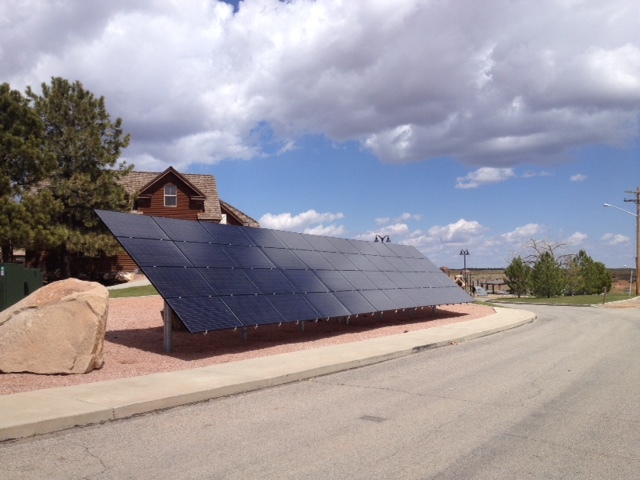 I used 43 kWh at 288 W/mile. I arrived at Needles with 35% battery left. Needles has 4 superchargers at a Shell station and I was the only one charging there. It was right next to the Rio Del Sol Motel where I stayed that night. Total mileage that day was 515 miles. I made 3 charging stops that day which added about 2 hours and 45 minutes. I actually enjoyed having an hour off every couple hours so I could eat or stretch. I charged in Needles for about 45 minutes that evening. One other note, the first leg of the drive was cool under 50 degrees so I had the air conditioning off and just used the fan. The rest of the day had warmed up, mostly high 70’s to low 80’s and I used the air conditioner the whole way and still achieved the efficiencies as listed above. I was pretty happy that the EPA numbers for the car were pretty accurate and Evtripplanner was a great tool. The next morning I was and on the road to Phoenix via the Quartzsite and Buckeye supercharger stops. The first leg to Quartzsite was straight south from Needles about 100 miles. I saw about 4 cars the entire way and desert landscape was beautiful. Arrived in Quartzsite at 8:30am after driving 105 miles. I used 110 rated miles, 32.1 kWh at 303 W/m and 45% battery left. There were 6 superchargers there and I was the only one charging. 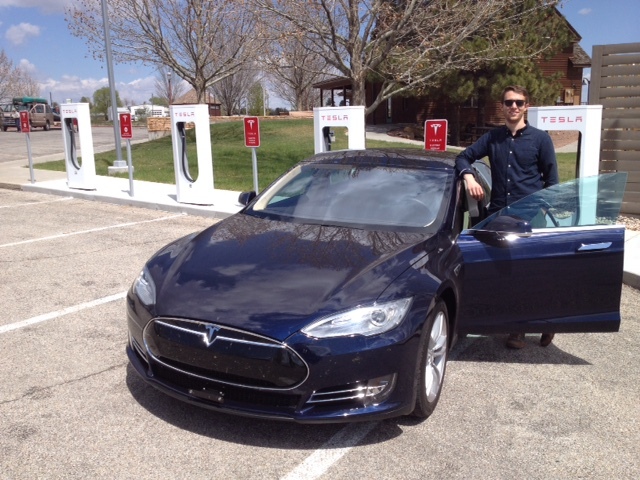 The last leg to the Buckeye Supercharger was 101 miles. I arrived at 11am, using 119 rate miles, 34 kWh, and 336 W/mile. The speed limit was 75 and I ran at 77 mph the whole way. I arrived with 42% battery left. It was 79 degrees. Each of the superchargers is located with restaurants or shopping near by, some better than others. I made one stop each day at a Rest Stop on the side of the road. California and Arizona have quite a few along the way. From Buckeye I drove about 30 miles to the Phoenix Airport to pick up my wife and then off to the Westin Kierland Villas where we are spending this week. The total trip was 763 miles. I stopped at 6 superchargers along the way. I may not have needed to stop in Barstow, but I didn’t want to take a chance since this was my first voyage out in the Starship Teslaprise, yes, that is what I named my car. The Tesla ran perfectly the whole way. For the most part it was uneventful and I saw some beautiful scenery and learned a lot how the car really operates on the open road. Everyone should take a trip in a Tesla! On Saturday I will pick up my son in Flagstaff and be off to Utah. More to come. Oh, in Phoenix I had the Tesla washed and detailed to remove all the bug art! Blink Network has charging stations all around the area. They are only 25amps and charge at 15 mph at a cost of about $3 per hour!! No wonder they all show available. I talked with the Tesla Sales Center at Scottsdale Fashion Mall and they let me use their HPWC at 80amps. This bye the way, was the spot I took my first test drive last year before ordering the car. Stayed in Monument Valley last night and added 50 miles of charge at Gouldings Lodge RV Park via NEMA 14-50. Monument Valley was awesome and took tour this morning. In Moab now to see Arches and Canyonlands over next two days, then on to Bryce an Zion! Worldwide increase in demand for EV’s. The Nissan Leaf is the world leader in number of cars on the road and increase in sales but all makes are up. Although total numbers are small, less than million worldwide, EV’s arre coming on market in a world dominated by ICE’s for a hundred years. The infrastructure for EV’s is just beginning and the technology is in it’s infancy. What is evident is that there is a market demand for EV’s and that demand is growing as consumers become familiar with EV’s, the number of models grows and the infrastructure comes on line. Battery costs are falling more rapidly than predicted. In 2007 lithium-ion batteries were priced at US$1000 per kWh. By 2014 the price ha fallen to US$300 per kWh. This has been due to increased demand and technological improvements in both the batteries and the manufacturing process. At this pace the US$150 price should be reached within the next few years as Tesla and Nissan bring their mass battery production facilities on line and further improvements are made to the batteries themselves. EV’s will be price competitive with ICE vehicles when the US$150 range is reached. At that same time consumers will be over the range phobia that has held up sales, the EV’s offered will have increased range and probably recharge more quickly. Those that own or rent a living space that makes charging at home possible will find it hard to resist a vehicle that is much cheaper to operate than an ICE vehicle. Environmental benefits of EV’s will lead to faster adoption. Mass adoption of EV’s would lead to less environmental devastation caused by fossil fuel extraction and transport, less smog in densely populated areas and cooler cities as well as other benefits. Certainly there is an environmental impact to manufacturing EV’s but the vehicles themselves have far fewer parts than ICE vehicles and therefore manufacturing impact should be less and the battery manufacturing process can be made nearly pollution free if we wish it to be. A recent study at Michigan State University found that EV’s produce only 20% of the heat that ICE vehicles produce. This translates to cooler cities and lower air conditioning costs. Will other technology jump ahead of EV’s? Toyota is pushing hard for hydrogen fuel cell powered EV’s but to date they haven’t solved all the technical problems needed to make the fuel cells practical and cheap and the infrastructure is a long way behind the battery infrastructure. But in the end there will be room for both formats. The biggest breakthrough that put a stop to individually owned EV’s is the driverless vehicle movement. If we all have multipurpose hand held device and a driverless vehicle can be summoned with the push of a button to drive us to our destination it would seem far cheaper to have the vehicles owned by a transportation company and just call a car as needed. Of course these vehicles are likely to be either battery or hydrogen EV’s. "At an election hustings last night the failure to grasp the need to focus and do something now about climate change was so obvious from the key parties. Sure they all make noises but it needs real guts to pioneer and challenge the status quo that is the political classes today. Right now you have a chance to insist even demand that if any candidate wants your vote then they must champion carbon reduction at far higher levels than the current Dorset target. Other countries will be mainly renewable before we even achieve modest targets and why ? Old thinking, attachment to fossil fuels, dependance on Nuclear and all totally un-necessary. Listen to your conscious and vote independently of old baggage or misplaced loyalty. Vote for the future of generations to come and the Planet. " I extracted the text below from a recent speech by Baroness Kramer. “The UK already has the best network of rapid chargepoints in Europe. And London has more chargepoints than petrol stations. I have a friend with an electric car and frequently travel with him. It is Ecotricity who have put the rapid chargers at motorway service stations and they are free (amazing!) The journey to London in a Leaf takes just one stop at Fleet services (which you would probably stop at anyway) and there are fast chargers all over the place. Travelling back from Bridport to Dorchester we stopped to top up at the little chef’s fast charger and when you look at a charger map (such as this one) to plan a 100 mile plus journey, your range anxiety disappears. 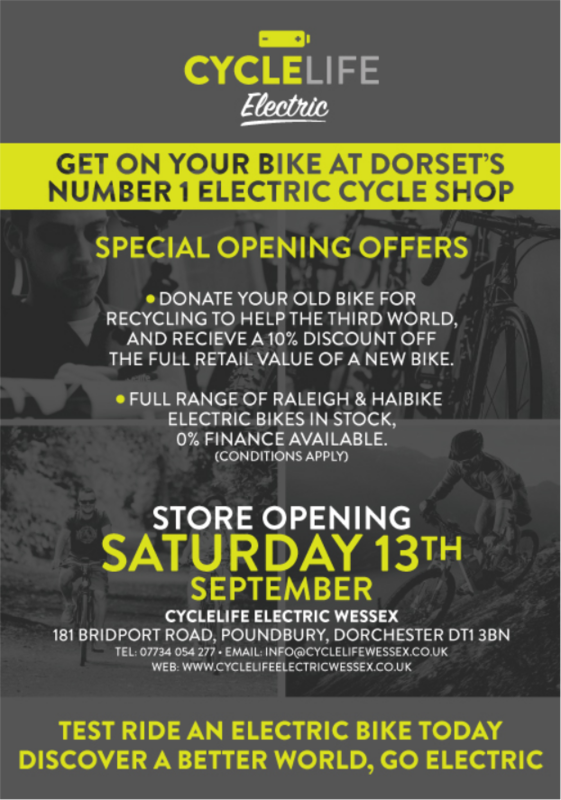 Our friends at the Dorset Ebike Centre have recently opened a new shop at Poundbury in Dorchester. The shop is called Cyclelife Wessex and it is the first Raleigh Cyclelife Shop which is entirely dedicated to selling Ebikes – the Raleigh range and the Haibikes. The shop has been open a few weeks but this Saturday, the 13th September, they are having the Official Opening – with a 10% discount on the day (though a “little bird tells me” that the 10% discount might well be available for anyone buying an Ebike throughout this week – just tell them you heard this from Dorset Energized :-). Anyway – if you`ve never tried an electric bike, why not pop into the shop, have a look. And if your tempted to find out for yourself why so many people are taking up this form of transport, ask for a test ride. You might be surprised by how much fun it is – and how practical cycling suddenly seems. And if you`re already Ebike aware – well a ride on a Haibike might still prove a revelation! We have the poster for the shop opening below – and roll on the electric transport “revolution”/”evolution”!